In 2020, the year when the second Tokyo Olympics will be held, the College of Science and Technology of Nihon University will celebrate its 100th anniversary. We are proud that our college has produced over 230,000 graduates that contribute to society in various fields within industry, government, and academia. In June of 2018, the first of the “Surugadai Campus Projects,” the construction of the South Tower (tentative name) will be completed. A short walk from the Hijiribashi Exit at Ochanomizu Station, you can see the new school building rising next to the Holy Resurrection Cathedral. From the appearance of the new school building, you can feel both our willingness to provide a warm and relaxing learning environment within the urban atmosphere of Tokyo and to establish a new center of excellence for education and research in the fields of science and technology. At the other campus in Funabashi there are also distinctive features. There are various cutting-edge large research facilities like an approximately 600 meter traffic experiment road in a vast area that is 6 times the area of the Tokyo Dome. We are proud that through education and research we are making the most of an environment that is unlike any other in Japan. 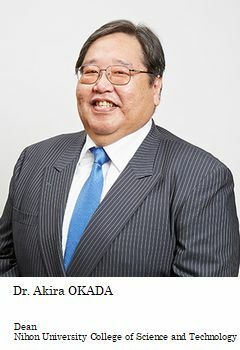 The education programs of our college are based on the concepts of its founder, Professor Toshiki Sano, who aimed for “practical training for engineers” in science and technology. Since the foundation of the Nihon University High School of Engineering, the predecessor to our college, we have been consistently training personnel for employment in the manufacturing sector. It is often stated that “Nihon University is famous for engineering,” yet this is just one of the accomplishments of our continuous educational programs over the last century since the founding of the college. With rapid economic growth, mass production in Japan has led to mass consumption and mass disposal. Perhaps due to reflection on such trends or due to a distrust towards science and technology which continues to progress and build on human knowledge, nowadays, I often hear talk of “Koto-zukuri”, which puts an emphasis on people’s experiences. Here at the College of Science and Technology, objects, or “Mono” in Japanese, are not just the things manufactured and consumed through economic activities. It is the essence of “Mono-zukuri” (manufacturing) that induces “Koto-zukuri” (value creation) and supports it. It is also our educational mission to develop people (“Hito-zukuri”) who can tactfully conduct such “Mono-zukuri” (manufacturing). What we value to educate our students for careers in manufacturing is an organic alliance among Science, Technology, Engineering, Arts, and Mathematics. These five elements form the acronym STEAM, which became widely recognized after the former president of the United States, Barack Obama, raised them as priority issues in education from the national strategic perspective in order to develop people who can be successful in the future. Our college has provided practical education focusing on these five elements since long before the acronym became popular. All departments sufficiently carry out STEAM education utilizing the various aspects and characteristics of each field, and this leads to skills in design and manufacturing in the end. CST-STEAM is the unique academic policy of the College of Science and Technology. Human-powered aircrafts, artificial satellites, micro-robots, space elevators, student design competitions, smart cities, and the “Mirai-Hakase-Kobo,” a workshop for making things for the future, are just some examples of what students design, create and manufacture through our consistently valuable educational programs. The success of our students and teachers has often been covered by the media. The application of CST-STEAM cultivates the capabilities of creativeness, practicality, and design. Please come to visit our campus. I would like you to come and see with your own eyes our educational achievements and how we have adapted with the times over the last century.